Known as the Tasmanian Blue Gum tree or the Blue Gum tree. The Eucalyptus is also called "Kino" by the Australian Aborigines who were the first to use its leaves for medicinal purposes such as to cover serious wounds. In 1788, the Eucalyptus Globulus Essential Oil was introduced to the Europeans and was the first oil to be exported to England under the name of "Sydney peppermint" due to the fact that it came from Australia. With its fresh penetrating scent, it is no wonder that this oil is the most common ingredient foundin salves and cold care products. Eucalyptus Globulus Essential Oil is also fantastic on such skin ailments as burns, blisters, wounds, insect bites, skin infections as well as lice plus help to combat the effects of colds and influenza. As an added bonus, this oil has also been applied to sore muscles and joints. Add 5 drops of Eucalyptus Globulus Essential Oil, 5 drops of Peppermint Oil, 8 drops of Grapefruit Oil to an ounce of water in a mister for an invigorating mist or just add 10 drops of Eucalyptus Globulus Essential Oil in a lamp ring diffuser for that feeling of positive energy. You can blend this oil with your lotions and creams, add some drops in your massage oil, dilute it in your bath or footbath or even on a cold compress (which is very effective for a nosebleed). Not intended for internal use. It is highly concentrated and should be properly diluted before using. It should be used with care and those with high blood pressure and epilepsy should avoid it at all costs and it may cause headaches if this oil is used excessively. Keep this and other essential oils out of the reach of children and pets. Eucalyptus Globulus Essential Oil can be used on the skin for insect bites or wounds even though you should be taking care when you apply this oil. Dilute this oil into your gargle so it can be used to soothe a sore throat. 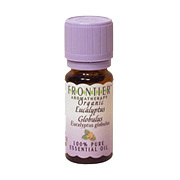 Eucalyptus Globulus Essential Oil Organic is shipped in a discrete, unmarked package. Orders are processed immediately and usually take about 3 to 5 working days to be received. We do ask that you try it for 2 to 3 weeks to feel the full effects. Any information received is used only for order processing and shipping purposes. Your information, such as e-mail address, will never be disclosed to a third party.